I've only had a chance to page through it so far, but this seems to be a continuation of what Geoff set up in New 52 JLA years ago. The art looks nice. I'd expect as much from Eaglesham, and it's good to see Geoff and Dale back together. However, I just think the whole thing is too far afield from classic Captain Marvel for me. I don't like 6 Shazam Family members, and visually, blond Freddy is yet another unnecessary change brought about by the New 52. I like a lot of what Geoff Johns does, but sometimes I feel he has too much power and makes everything into his personal fanfic version. I hope this series is good, and I'm glad the character is back in print, but I would rather have had Geoff take the original concept and make that work rather than make the changes he did. Also, I doubt very highly I'd ever call this character "Shazam." This was the worst change of all. If you HAD to change the name for trademark reasons, I would still want him called Captain-Something. Some thought should have been put into a more suitable name that could then be trademarked marketed to the public for comics, movies, and merchandise. I suppose that now that the movie is soon to arrive, we'll be stuck with that awful Shazam name forever. By the way, what are the other characters called? So, what are your thoughts on the new Shazam comic, and are you ok with Shazam as a name for Billy? I have been waiting this for way too long and I'm glad that it didn't disappoint in the slightlest. Billy is still based on the new reinvention of the character that makes him tougher but at the same time, he has grown closer to his family and is not as cold as before, Johns has find a good balance here between old and new Billy. The dynamic between the kids is pretty solid as well because Johns remembers that these are actually kids who argue about silly things like how boring school is or figuring out their team's name. Plus, there's that classic Johns' worldbuilding which is a bit predictable from him but on the other hand, it still allows for intriguing developments. Eaglesham is a great artist but I'm not sure if he was the right pick because his tone can be a little too dark for the series. The second feature was pretty fun due that we learn more about Mary and freaking Hoppy, the Marvel Bunny is back! Which is reason enough for me to love this. The art was much better here than in the main story because the Manga-esque style allows for cuter expressions and direction. Quite promising overall. Is funny that we got a first issue that completely nailed it (this one) and another one that completely failed (Martian Manhunter) in the same week. What a fantastic first issue! It was fun, light hearted, and a much needed breath of fresh air in this modern grim dark DC universe. I thought it was everything a Captain Marvel book should be. Really looking forward to where Johns takes us! SHAZAM! The recap: I'm glad the recap was quick, just a few caption boxes. So Billy instantly gets help, we discover the Shazam Family can in fact all now power up themselves. Billy's act at the end of the 52back-Ups was in fact permanent, they can now all call on the power themselves to transform. I was wondering if that would be the case going forward? And here we see them in action. This was hysterical, the kids debating what name to go by, pretty much the whole discussion mirrored several ones on these boards. Not sure how long they are going to be able to keep this from their foster parents? Access to the Rock of E by closet? This will be a fun and convenient way to get the adventures going. 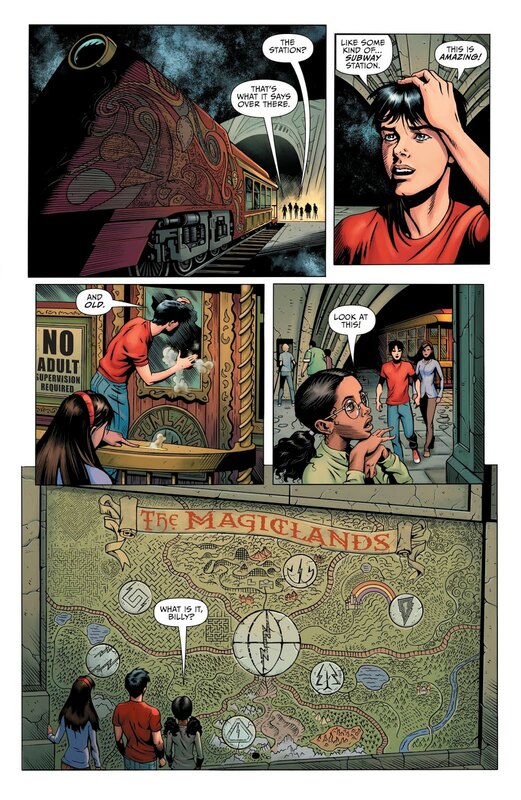 The map, love the train station room, which builds on the idea and visual of the original train that brought Billy. And the set up for the 7 Realms. Great page, Eaglesham's art is fantastic. So the Magiclands reads very much like Disneyland map. Each has it's own symbol, repeated on the seven thrones. One to the left looks like a maze, as does the land it represents and endless landscape of mazes. One with a castle and rainbow, uses the standard SHAZAM bolt. At the bottom, the one looks like a safety warning sign, that land contains pyramids, could be Kahndaq related? Looking forward to find out what all this is. Two great surprise reveals at the end of each story. The N52 back up hinted that Billy believed his parents were still alive. So this was pretty tremendous. We also see that Captain Marvel persona is a bit of an idealized projection of Billy's dad. Although it's almost to obvious this can't be what it looks like, so Billy is being set up for some hurt. The Mary back up by Sen art is charming, but I'm not crazy abt the shift, and would rather this story (some of which takes place at the same time as the lead story) was incorporated into the main narrative (which was to short anyway. This whole every orphan has a horrible past of nothing but evil foster parents is a bit much, my impression was Mary was a well adjusted character who never went through that, but I guess the Vazquez' are the counter to that. I guess they can share the power too! That last page was quite joyful! Great, fun set up. Looking forward to more Captain Sparkles! Last edited by Güicho; 12-06-2018 at 05:39 AM. I'm not crazy about having so many Marvels (Shazams?) and I don't think I'll ever get used to a blond, long-hair Freddie...but I enjoyed the first issue and look forward to where the series is going. Hope the wait between issues isn't too extreme. A great and fun issue, right up there with Super Sons for me. Would love for them to be the Marvel family, but since the Marvel comics company won that court case, I don't see that happening. The opening paragraphs to this issue pointed that out, too. end of spoilers thing that's sometimes used. Did they just create Captain Carrot? I'm not sure why people have a problem with there being so many Shazams. Hasn't there always been multiple different people wearing the costume at the same time and being apart of a larger family? What's different about what Johns is doing with it? Here's the thing: there are now six Marvels (a term that I will be using for now), and seven seats. Whose to say that sometime down the road a seventh Marvel will be created? Also, since Billy is "Shazam" now, whose to say that he won't create his own champion? You know, a "Captain Marvel"??? Loved it. Was it perfect? No, but I'm very happy that Johns is continuing his work on Shazam, which was, in my opinion, best thing he has done since GL:Rebirth. Speaking of which, will Adam fill the 7th seat? Last edited by astro@work; 12-06-2018 at 05:04 PM.